Three days a week, from 9 a.m. to 1 p.m they come and they wait. Three days a week, Monday, Wednesday and Friday they come just to get a drop of reprieve from the outreach center; a bus pass to the VA or to get to a job interview, a bag of groceries, a voucher to get used clothes at the thrift store, maybe a small amount of money to help pay an overdue utility bill, and sometimes just to talk to someone, anyone who will listen. The homeless, the disabled, the sick, the unemployed, the downtrodden, the marginalized, addicts and ex-cons just out of the "big-house" all stop by. All are different, yet all are living with one common denominator running their lives---survival. It was 8:30 a.m. and the sun was already doing its thing, slowly roasting the folks as they waited patiently for the doors to open, some having been there since 7 a.m. Florida, ah yes, palm trees, blue skies and beaches--just another day in paradise. Andre and Jessica had made the three mile walk to the St. Vincent de Paul outreach office and had arrived at 8 a.m. They signed in and were #11 on the list. At 10:15 a man opened the door and called their name. As they approached he smiled and said, "Hi folks, c'mon in. Sorry it took so long. How you guys doing today?" He knew how they were doing and they knew that he knew but his friendly, unbureaucratic manner quickly put them at ease. "Okay, have a seat. I'm Joe. At least it's cool in here, right?" They sat, sighed and let the cool A/C soak into their overheated bodies. They said nothing. "Well now," Joe said looking straight at them, "I can see you have some heavy duty stuff going on. I hope we can help. So, what exactly is happening?" They were a mixed race couple and they could feel inside themselves that whoever this man was it did not matter at all. You can just sense some things. They loosened up. Andre began to speak and tears quickly fell from Jessica's eyes. "Look, man, we got two kids, six and eight years old, and we're getting kicked out of our place at 11 a.m. if we don't come up with $58.00, and we ain't got a dime." "Where are the kids now?" Joe asked. “With a neighbor. Look, we don't care so much about us but the kids need a bed tonight, know what I mean?" "I do Andre, I do. And for what it's worth, you guys need a bed too. Where you staying?" "Oh yeah, I know the place well. Here's the thing, Andre, we don't pay rent monies from this office. We just don't have the funds. But let me make a call." Joe picked up the phone and pushed the numbers for the Barkley. He knew them by heart. He smiled kindly at them and, as he waited for an answer, twirled his finger in the air as if to say, "C'mon--pick up already". After several moments went by he said, "Hello, hey Sam, this is Joe over at the St. Vincent de Paul outreach office. I have a couple here, Andre and Jessica-----What? What are you talking about? You have to be kidding me. They have until 11:00 a.m. Look Sam, these folks need that room now--not a new one tomorrow. You should have called me. Now, just “unrent” their room. I’ll be over myself about 12:15." Andre's and Jessica's hopes had risen and fallen in a matter of moments. Andre, a big man, said, "Man, what we gonna do?" Joe asked, "What happens after tomorrow? Getting through today is almost like a stay of execution." "No, no, tomorrow I know I can get some work. Just gotta get through today. Plus, we got a place lined up for next week. Her mom worked it out. She's up in Jersey and she knew someone and, anyway, come Saturday we'll be okay. She’s even sending bus tickets for the greyhound over on 9th St. We leave Saturday afternoon. Next week is 4th of July and we plan on being in Jersey and celebrating. We just gotta get through till Saturday." "No kidding, Andre. That's awesome. But today is only Wednesday. Well, we can't have the kids without beds tonight….and tomorrow too. Now, here is a food voucher. Go across the street to the pantry and get some groceries. Then bring them home with you." "They ain't been too nice to us over at the motel. And if I ain’t got the $58.00 they won’t let us in." "Don't you worry about that. Trust me, okay. You go back there, everything will be all right." It was almost 1 p.m. when they arrived back at the motel. They walked to the front desk and Sam, the manager, smiled at them. "Okay, I have good news for you. You're paid up through Saturday." Jessica almost collapsed from relief. Andre held her up and a happy tear rolled down his cheek. Back at the St. Vincent De Paul office Joe finished up the paperwork from the 23 clients he had served that day. As he filed Andre and Jessica’s sheet into the folder, he held it up for a moment, looked at it and smiled. And a well-deserved smile it was. The following is true. And even though it may have happened 700 years ago, in many ways people then were like people now. When it comes to our wants, needs and emotions nothing has changed. And when it comes to family love; especially when it comes to family love coupled with prayer, that often makes for an unbreakable bond for all eternity. Arnold Armengol was a member of the Spanish hierarchy. His son, Peter, in spite of being given the finest education and upbringing, rejected all of that and left home. He quickly fell into the secular trap of self-centeredness, self-gratification, and outright depravity. He even joined a band of criminals that preyed on people traveling up into the mountains. Peter was so good at this work he eventually became the gang leader. Two years after Peter left home, his dad was asked by King Jaime of Aragon to lead him on a journey to Montpellier so he might meet with the King of France. King Jaime had heard of the brigands that preyed on mountain travelers and knew that Arnold would be the one who would keep them safe. As Arnold Armengol led the King’s entourage through the mountain passes they were attacked by a band of highwayman. As the robbers charged toward them. Armengol led his men in a counter attack. With his sword drawn he headed directly for the leader of the pack. They were about to engage each other when the brigand fell to his knees. He had recognized his father and with tears streaming down his face, prostrated himself at his feet . Surrendering his sword, he begged his father for forgiveness. The constant praying of Peter’s father for his boy were about to be answered in an amazing way. Peter Armengol, repentant and seeking mercy, was filled with shame. He appealed to King James I for a second chance. Standing before the King with his dad at his side the King granted young Peter a pardon. Shortly thereafter, heeding the graces offered to him by God, he entered a Mercedarian Monastery in Barcelona. Soon after, Peter Armengol became known as Friar Peter. 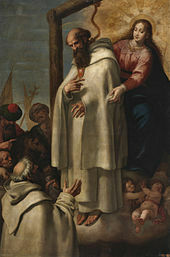 The mission of the Mercedarians, (The Order of the Blessed Virgin Mary of Mercy) founded by St. Peter Nolasco, was to ransom Catholics taken hostage. Peter excelled at this task and, over a period of eight years, managed to negotiate the freedom of many hostages from the Saracens. . (The Mercedarians take a fourth vow. Besides poverty, chastity and obedience they also vow to always be ready to exchange their own lives to free a hostage). Friar Peter then headed to Africa with Friar William Florentino. His goal was to ransom Christians from the Moors. On arrival in a place called Bugia, he heard about 18 Christian children being held hostage. They were under the threat of death if they did not renounce Christianity. Friar Peter offered himself in exchange for the hostages. The captors agreed but warned Peter that if the ransom was not paid on time he would suffer brutal torture and death. Peter Armengol was canonized a saint on April 8, 1687 by Pope Innocent XI. On this Father's Day we might also remember how his dad, Arnold Armengol, prayed unceasingly for the safe return of his son. His prayers were surely answered, a lesson for us all. Sometime during the early summer of 1973, Jesus Gaytan and two friends began making their way north to the United States. They were planning to ‘”sneak” across the border and find work as farmhands. They did not care where, they just wanted to work. At the border their plans quickly unraveled. They were spotted by the Border Patrol and, frightened, ran back toward Mexico. Jesus became separated from his friends and began wandering around the desert. He had no idea where he was. After several days of walking and wandering and without any food or water left, Jesus was sure he would die. As he stared across the bleak landscape peering through the undulating heat waves rising from the ground, he saw a pickup truck coming his way. Not knowing who was approaching, he became instantly afraid and yet also relieved. The truck pulled up and a young man with light skin and blue eyes stepped out. He smiled and gave Jesus food and water. Then he directed him to a nearby farm where they needed workers. He also gave Jesus a few dollars to keep in his pocket. Jesus thanked him profusely and asked him where he could return the money to him. And so the story goes that years later Jesus Gaytan did make that trip to Santa Ana de Gaudalupe. When he arrived he asked how he could find Toribio Romo. He was directed to the small church nearby. Hanging on the outside of the chapel was a large picture. Jesus stared wide-eyed looking up at the picture. It was the man from the desert, Toribio Romo. Jesus had arrived at Toribio’s shrine where his remains were kept. He was shocked to learn that the man who had helped him in the desert 20 years before had been beatified in 1992 by Pope John Paul II. He was doubly shocked that his rescuer had been murdered in 1928 during the Cristero War. Jesus Gaytan realized he had been saved by a man sent from heaven. Toribio Romo was born on April 16, 1900 in Santa Ana de Guadalupe, Jalisco, Mexico. He was, with permission from the bishop, ordained a priest at the young age of 22. His age did not matter to the authorities. The anti-religious Constitution of Mexico had been enacted in 1917. Toribio may have been only 22 but he was immediately placed under watch by the government. Then along came the fateful year of 1927. That was the year that the Catholic hating president of Mexico, Plutarco Ellas Cartes, ordered his soldiers to strictly enforce the anti-religious Constitution of 1917. Besides saying Mass “under the radar” and making sick calls and hearing confessions, Father Toribio had also been teaching catechism to both children and adults. Now he was told to confine himself to his residence and to not say the Rosary in public or offer Mass. The young priest took up refuge in an old factory near a town called Agua Caliente. Here he defied the secular authority and celebrated Mass and tended to his ministry the best he could. On February 22, 1928, Father Toribio, began organizing his parish registry. He finished doing that on February 24. Father Toribio knew the danger he was in and he was afraid. He prayed daily for God’s grace and strength but would not let his fears stop him from doing his work. It was 4: 00 am on February 25 when the young priest climbed into his bed to get some sleep. The soldiers did not care. One soldier fired and the wounded priest stood up and began to walk toward the soldiers. After a few steps they opened fire and Father Toribio Romo fell dead. The story of the young priest’s martyrdom spread quickly and his popularity soared. Many Mexicans who have headed north tell inspiring stories about how their lives were saved through the intervention of Father Toribio. In 2000, Pope John Paul II canonized Father Toribio and 24 other martyrs murdered for their faith during the Cristero War. Today, Santo Toribio Romo, is honored as the Patron Saint of Mexican migrants and “border crossers”. He is a saint who all Mexican and American Catholics should pray to for help with the border crisis confronting us today. Saint Toribio Romo, pray for us.